Start in Apache Junction (just east of Phoenix AZ on US Highway 60). Continue on Highway 60 to Superior ... continue on 60 to Globe ... and continue on 60 to the ride's end point in Show Low, AZ. 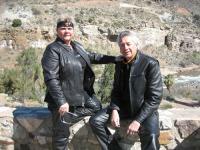 March 2008, we rented a 2007 HD Road King Classic from Liberty Motorcycle Rentals (new owner-Gary from Maple Grove, MN relocated his bikes to AZ 888-484-0477 rental was everything he said it would be-awesome!) located near the PHX airport. West 60/Superstition - some freeway riding here - hillsides of yellow flowers bloom, pass the Renaissance Festival winter site - to Apache Junction. Stopped at Dos Hermanos-bike bar and watched the bikes go by. Continued on 60 to Superior then Globe. Still lots of bikes, BUT after Globe - only bikes headed south!!! Get gas - road to Show Low very sparse gas. Start to climb noticeably - is cooling off. All leathers on now. Road is very manageable but bendy and curvy with incredible views. Stop at Salt River Canyon look out. Awesome!!! Apache Indians vend hand made jewelry here. Going north - colder. 7000 ft.up - Show Low very small -HonDah Casino - 15 min outside town - clean-affordable-outside hot tub - good choice. deep snow now but roads good - Ski Hill-name unknown-nearby. Flat road out of PHX with some freeway riding. Traffic heavy to the Renaissance Festival site-then opens up. Roads are very good with lots of curves and gradual climbing. With 2 on the bike it was very comfortable at all times. Renaissance Festival winter home on HWY 60 to Apache Junction. Dos Hermanos Bike bar - Apache Junction. HonDah casino is very clean and has good amenities and family friendly. on November 4, 2011 1 out of 1 members found this review useful. Fall 2011. Great ride for new or experienced rider. Very scenic. Bee Line Cafe in Payson great place to stop for a break and breakfast. Dress in layers. on November 4, 2011 1 out of 2 members found this review useful. Oops! My previous review was for the route through Payson instead of Globe. However, we have biked both routes to and from Show Low. Both are great trips. At the SR 188 & US 60 Junction is a very good cafe with the best ever cinnamon rolls. on November 27, 2009 1 out of 1 members found this review useful. Rode from Show Low into Globe. Awesome. Big sweepers frame the canyon - nice twisties. Watch for tourist pylons - some big trucks. on April 12, 2010 0 out of 0 members found this review useful. This is a great route and it gets even better if you ride past Show Low and onto Pinetop into Greer. Stay at the cabins at Greer Lodge.. gorgeous bike ride, not alot of traffic and nothing better than kicking your feet up on the front porch of your cabin after a long day on the bike.